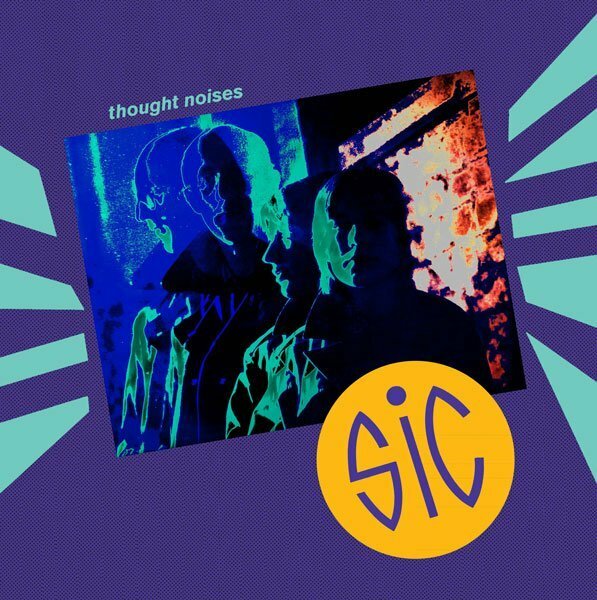 Dark Entries is proud to shed light on underground Belgian New Wave pioneers, SIC, with the career-spanning release “Thought Noises.” SIC were a post-punk band from the industrial city of Charleroi in the francophone part of Belgium. They were formed by Francis Pourcel, Alain Neffe (Bene Gesserit), Micheline Dufert, and Mario Berchicci in 1977. Francis and Alain had previously played with Krautrock band Kosmose in the mid 70s. In 1978 Alain left the group to launch the cassette label Insane Music. The new trio released their debut 7” “Voltage Control” in 1979 on Artibano Records. By 1980 Mario left and was replaced by a Korg KR-55 drum machine. As a duo, SIC self-released the “Cover Girls Smile”/ “Between” 7” in 1980, which was played by John Peel on Radio 1 in London. Unable to replicate the studio sounds for live concerts, the duo recruited three additional musicians, Wilhelm Dunker (bass), Henry Krutzen (saxophone) and Danièle Daoust (synthesizer). In 1981 their final 7” single, “Free Radio Stations” was self-released and the band recorded a demo tape to help secure live gigs. SIC continued to play live over the next two year but eventually broke up in 1983. SIC stray from more conventional post-punk, mixing the affordable Korg MS-20 and Roland RS-09 synthesizers with jazz and funk elements. All three 7”s and demos are united by strong, watery Rickenbacker bass chords reminiscent of American jazz legend Jaco Pastorius and UK bassist Mick Karn (Japan). A heavy reliance on rhythm and Micheline’s strong, insistent voice give SIC its own moody personality. More of a European group than a Belgian one, SIC take cues from Magazine, “Live At The Witch Trials”-era The Fall, Delta 5, The Raincoats and Kleenex. Their lyrics are original and autobiographical, documenting commercialism, technology and communication as we enter the 1980s. “Thought Noises” compiles all three SIC 7″ singles released from 1979-1981 plus 6 unreleased demos from a 1981 recording session. All songs have been remastered for vinyl by George Horn at Fantasy Studios in Berkeley. Each LP includes a lyric sheet insert. More than 30 years later, SIC are a document of a mutant strain of new wave ripe for discovery.